Inspired by the beauty of the Pacific Northwest, *Copper Creek Villas and Cabins at Disney's Wilderness Lodge* features natural elements, such as wood and stone, in its design, as well as subtle nods to the American transcontinental railroad. 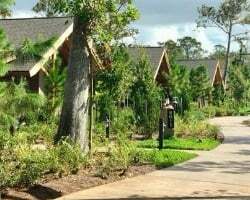 The resort offers one of the widest ranges of accommodation types at Walt Disney World Resort. Copper Creek Villas and Cabins features 184 rustically elegant accommodation options, including Deluxe Studios, one- and two-bedroom Villas, three-bedroom Grand Villas and unique Waterfront Cabins. The resort is a short water taxi ride away from Disney’s Magic Kingdom, and offers easy bus access to the rest of the Walt Disney World Resort, making it the ideal home base for families looking to explore a wide range of Disney attractions. To discover more, please visit https://disneyvacationclub.disney.go.com. Own has 300 available points ready for use in 2019! Use points at any of the other 13 original DVC resorts! Inquire for details!